Wayanad wildlife sanctuary, beholding a wonderful collection of animal and plant species is a perfect choice for your holiday packages. Amiable cool climate and living species present in this sanctuary makes it a favourite destination of zoologists and botanists. Wayanad wildlife sanctuary, enriched with amazing biodiversity is an important destination explored in holiday packages. This wonderful place beholding amazing flora and fauna was established in the year 1973. Mind blowing natural landscape present in Wayanad wildlife sanctuary presents a real feast for the eyes of tourists. As per research, Karottimala located in Wayanad wildlife sanctuary is considered as the highest peak present in this region. Astonishing view of surroundings with the cool climate of moist decidous type of trees gives you evergreen memories to cherish in for lifetime. You can find here a wonderful collection of plantations including trees like teak and eucalyptus. Rosewood, bamboo and vengal are other types of trees present in this region. Wayanad wildlife sanctuary is the house of rare varieties of living species. Some among the wild animals living in Wayanad wildlife sanctuary include sloth, cheetal, leopard, elephants and jackal. This natural biosphere lies close to Nagarhole and Bandipur of Karnataka and Mudumalai of Tamil Nadu. Some among the near by haulting place to Wayanad wildlife sanctuary include Sulthan Bathery and Mananthavadi. This habitat of wide varieties of living species spreads over 344.44 sq kms in area. As a whole, this enchanting tourist place can be described as one among the favourite destinations of nature lovers and adventure seekers. 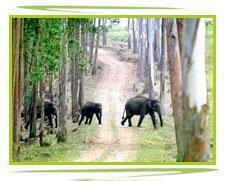 Superb natural landscape of Wayanad wild life sanctuary pleases the eyes of visitors. 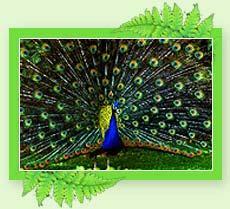 Groups of wild living species like elephant, tiger, peacock and peafowl makes the land a real paradise of south India. This tourist centre located in God's own country attract thousands of tourists from all over the world. It can be best described as one among the favorite tourist spots of bird watchers and animal lovers. Amiable cool climate with a rare collection of animal and bird species, makes Wayanad wildlife sanctuary a perfect spot for your holiday destination. This beautiful area present in Kerala spreads over 344 sq km in area. This wildlife sanctuary is also known in the name of Muthanga wildlife sanctuary. Sulthan Battery is the nearest town located near Wayanad wildlife sanctuary. Tourists can easily reach this destination by travelling a distance of 16 km from Sultan Battery. At present, Wayanad wildlife sanctuary is coming under the part of famous Nilgiri biosphere reserve. Nagarhole, Bandipur and Mudumalai are other popular surrounding areas of Wayanad wildlife sanctuary.